Pay per click can reach a wide audience instantly and give your brand the exposure it needs. Our PPC campaign strategies are designed to meet the needs of our many clients and their market conditions. Our Pay-Per-Click services include: Paid Search Ads, Video Advertising, Display Ads, PPC Remarketing and Social Advertising. Let our expertise help you. We help our clients achieve their business objectives by regularly managing each of our client's accounts and constantly monitoring bid prices and budget to make sure we are maximizing ROI based on the spending from PPC. PPC is a broader campaign aspect and can save you considerable money if done properly. We'll focus on big keywords that are more likely to convert, keep an eye on the conversion ratio, and tweak ad or content of webpages to improve this ratio. 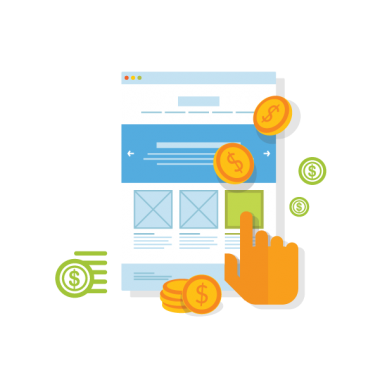 Let your ad campaign make the most ROI possible with our expert PPC help. We know how to tweak your ads and pages to ensure you get the most bang from your ad campaign. Turn your potential customers into real customers. Our team can help you re-engage users who have already expressed an interest in your products. Re-marketing will motivate these users to actually do business with you. Need to generate awareness about your brand, product or service? We develop a social advertising strategy aimed to meet your targets. Together, we'll get people buzzing about your products on social media. We offer individual banner and text marketing strategies to get you brand exposure, engagement and conversions. We can manage both your brand awareness campaigns and direct traffic strategies through these campaigns. We are experts in the most promising online advertising formats, and our team is ready to help you stand out from your competitors by creating video advertisements that will maximize your much-needed brand awareness. We’ve got the experience to create award-winning campaigns on Google AdWords, Bing, Facebook, LinkedIn, Twitter and YouTube. Contact us today and get maximum returns on your investments.